was extremely dark and very disturbing. Although it's rated "G" and described as "a festive addition to the holiday library that the entire family can enjoy" in its press release, I soon realized that it was a work which I felt that it would be best to advise parents to avoid for children under the age of ten. This being said, initially, it sets itself up harmlessly enough. The film centers on the ambitious Niko, a young reindeer who wants to join Santa's Flying Forces of brave reindeer alongside his father whom he's never met, but we deduce in a rather abrupt, subtle yet still pointed conversation revealing that he'd impregnated our young hero's mother as though she were a groupie in a one night stand-- or rather-- sleigh ride. Unable to fly no matter how badly he wishes he could as he's coached on to believe in himself and ignore the bullies who thrive on his failure by his loyal squirrel and surrogate father Julius (Norm MacDonald), Niko secretly makes plans to practice his skills and pursue flying lessons on Antler's Hill. When he mistakenly leads the villainous and deadly pack of wolves back to his community of Home Valley, suddenly the entire population is at risk by the wolves who intend on eating every reindeer in sight. 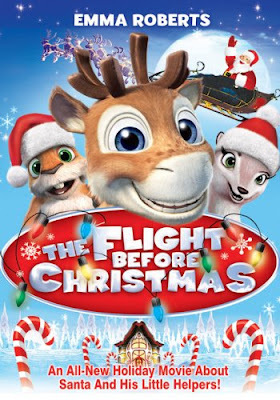 When Niko and Julius separate from the group along with a singing weasel named Wilma (Emma Roberts), soon the wolves decide to change plans and make their way to take on not just Santa's Flying Forces of Reindeer but eat Santa as well as all of the little children to whom presents are delivered around the world. With such a macabre and off-putting, sinister plot, The Flight Before Christmas is sure to be upsetting to young children who may develop nightmares about wolves aspiring to eat Santa and babies as well as a storyline that just doesn't fit the holiday film paradigm by including a "River of Certain Doom," Santa's reindeer who act like a group of hard-drinking, horny frat-boys, and a teenage runaway etc. And while ultimately it offers an excellent message of being true to yourself and choosing your own family among friends and those who love you without question and the sheer gorgeous quality of the animation is remarkable and rivals that of first-run, big screen animated fare, this international production from numerous European countries has its heart in the right place but just doesn't quite understand how to craft something appropriate for its intended demographic. Of course, a darkly comedic holiday tale is fine in theory and for adults has worked well with Bad Santa as well as teens who latched onto Tim Burton's cult classic Halloween/Xmas hybrid The Nightmare Before Christmas or even the classic How the Grinch Stole Christmas from Dr. Seuss. However, without trying to market or develop itself correctly to tweens and early teens of the Harry Potter age and instead by packaging it as though it were as harmless and sweet-natured as other holiday films for true youngsters, Flight just crashes and burns. Not helped by awkward voicing by Norm MacDonald or a poor script-- the sole saving grace is the masterful CGI animation as it is sheer textbook-level. Although it would've been best appreciated as though it consisted only of select stills playing in a digital picture frame with the sound off and leaving the idea of going Hannibal Lecter on St. Nick tossed outside in the snow-- without enough layers of clothes on for protection so that ultimately it will end up freezing and disappearing from sight altogether, ensuring that sugar plums are the only dessert dancing in children's heads and not visions of the corpse of Santa Claus.